This entry was posted on	November 14, 2008 at 12:52 pm	and is filed under homelessness. I tend to agree. Nothing like ’em. At the end of the line stands Lena surrounded by mountains of Tickle Me Elmo’s. She has a roll of plush Red fabric and a huge bag of small marbles. The 2 men watch in amazement as she cuts a little piece of fabric, wraps it around two marbles and begins to carefully sew the little package between Elmo’s legs. I havent been by in a long time and am just catching up on your posts. Good to see you’re still in the blogging world. You guys should connect with a Toronto city photographer and put a book together with this dialogue. Just a thought. Maybe I can get a arts grant and come up and take the pics that would go along with your words? that would be fun. I loved the post on the swedish woman….made me laugh out loud. love butter tarts…..there are worse ways to be paid. You know I think butter tarts are kind of a Canuck phenom. Out east, we make them with maple syrup….yummy. Tonight, I am attending a memorial service at the soup kitchen in Fredericton. It is a service to recognize the homeless people in the area who have passed on. I don’t ever remember a service like that here and I think it’s more than overdue. Keep on writing and posting! It may indeed be that I misread how you — and perhaps others — would “take” the intended message from the painting. I trust you are not further suggesting an intent to offend. Understood this way, I think you ask a decent and entirely fair question. Here’s my PoV. The painting is a well-known Manet, notably emblematic of a certain time and a certain imagistic language and a certain segment of society. I see in this a metaphor in Tony’s rapturous response to an “ultimate” element of his life, the consumption of exceptional butter tarts. In historical terms, do I really wish to deny that this depiction was ever created? No. That the Romans fed humans to lions in the a public arena? No. This painting is a universally accepted piece of great art, even if it might be deliberately offensive to paint iand display in today’s world — which I doubt given what other pictures are quite easily available. Also, I believe that fanciful paintings are one of a very few artifacts that can deliver a gut-level sense of another time. That’s very important to me and many others. I spoke to Tony today (he called me from a payphone). He’s a bit skinny, but he’s OK, such as that means. He has, howevr, warned me that he may be off the streets in the Don Jail if he can’t find an organization prepared to accept 20 hrs of community service from his trial last yr.
ahh….other readers please excuse this segue.. I do sense you are caring and sensitive person Phil.. I’m just commenting as a reader and observer..
Now to the issue at hand.. the painting.. in my next post…. .. so on the premise of contextuaizing the blog from *your POV* you chose to illustrate the last post with a ‘classic of Wester art, the painting ‘Le déjeuner sur l’herbe’ by Monet And obviously only those schooled in western art history would know the painting. 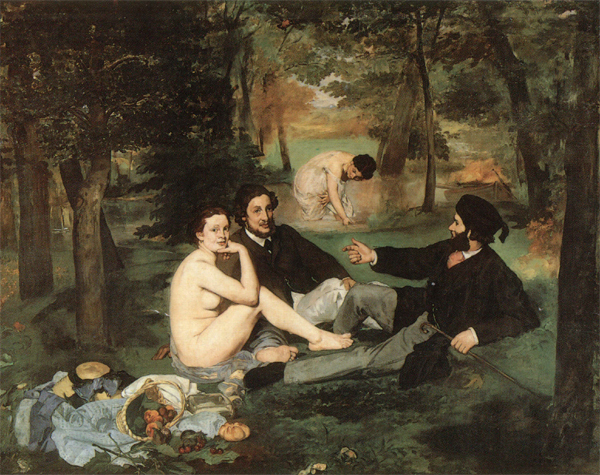 But to those who wouldn’t know this painting they see an image of a naked woman sitting on the grass with dressed men. Now.. gee hmm… what could be odd about that??? Now as an intelligent man you do know about ‘reading images and symbolism Phil. And If feminism or analyzing the representation of women – has completely bi passed you (and I doubt it has) this image is offensive. ESPECIALLY when you make the reference to the woman and tarts. I don’t need to spin into the socio economic condition of women through history.. do I? Or the way women have been objectified? One of you two *got it* that the Swedish woman walking down Roncesvalles did not like to be gawked at, rather respected. I’m telling you that when you so liberally post images of objectification of women – remember that we women, take issue with what patriarchal representation has done with us. Hence I said ‘no context’ and alluded to Marie Antoinette’s ignorant ‘let them eat cake’ phrase. Now back.. consciously to deal with another social blindness.. homelessness through the dear man Tony .. and the light you are giving to his story. Phil, I love the obscure pictures, the sassy titles, and the way they highlight Tony’s bright simple unintentionally philosophical comments. The universe speaks to and guides us constantly. We just need to recognize what language is being spoken and when. Thank you for translating for us. Philip & Tony – just found your blog a few hours ago and read the entire thing. Glad to see people reaching out to the homeless community. Always try to watch out for some of the regulars here in Austin, TX. Homeless people generally have great stories and really appreciate when you can do something for them. I loved hearing that people need socks. I think I’ll get some later today and go hand some out tomorrow. Thankks for the advice!